"A typeface defines the shape of the characters. Some common typefaces are Times New Roman, Arial, and Courier. If you look closely, you will see that the letters in each of these are shaped differently, some narrower, some more rounded, etc. ﻿How can I format text in a program? You can ﻿﻿change the font﻿﻿ by clicking on the font menu drop down. Click on a font to select a font. To change the size of the font, click on the font size drop down, generally next to the font drop down. 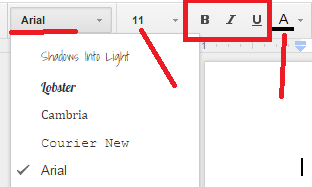 You can BOLD, italicize or underline your font by click on the B I and U at the top m﻿enu. To change the color of your font, click on the A with the color underneath (in this case, black) and select to either change the color of the font, or change the background color behind the font, also known as ﻿highlighting﻿.